At a certain point, it would be wise to just leave the Chelsea High record books in girls’ track blank until junior Stephanie Simon graduates. 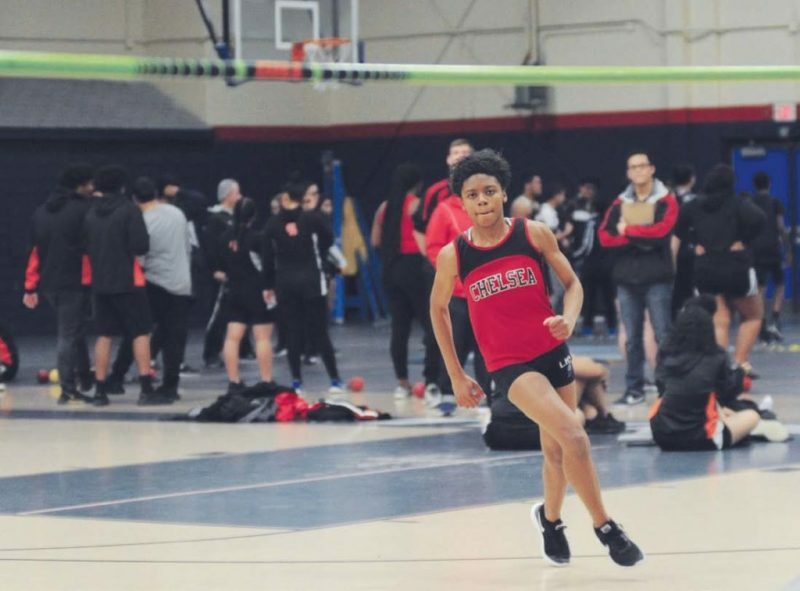 Chelsea High junior Stephanie Simon is putting together another outstanding indoor track season this year, and will head to the National Championship meet in New York this weekend. When she’s not on the track, though, one might find her weaving in and out of the streets on her skateboard. The champion jumper, runner and hurdler tends to break most school records, and then break her own records time and time again. At a certain point, her coaches say, they will probably fill it all in after she graduates. Simon, 16, comes from a strong athletic family – and her sister, Martine – is the only runner to have ever beat her in a meet. Now, she has focused in on jumping events and has put together a string of wins during the indoor season this winter. Recently, she took first place in the Division 2 state long jump, and took second place in the New England Championship meet. Earlier this year, at the multi-state Dartmouth Relays, she took first in the long jump and high jump. This weekend, she will travel to New York City for the second year in a row to compete in the National Championship indoor meet. But back in Chelsea, if you see a young lady cutting it up on a skateboard, that might be Stephanie Simon. Simon was born in Chelsea to Hubert and Mathilde Simon, who originally came from Haiti. Her older brother, Norbert, was also a track standout, as was her sister, Martine, who graduated last year. She said her younger brother, Emanuel, has potential in the 200 sprint. She attended the Early Learning Center, the Berkowitz School, the Clark Avenue Middle School and has settled in at Chelsea High – where she keeps a 3.4 grade point average and is active in academics. But her cool demeanor likely comes from having to contain herself on the track. Unlike with the sprints – where she also has great success within the conference meets – she said she has learned that a jumper (whether high jump, long jump or triple jump) needs to stay in control. It will be a very important quality when she arrives at the New York City Armory this weekend with her coach, Cesar Hernandez. Last year was her first indoor national meet, and she said it was overwhelming. When she went to the Dartmouth Relays earlier this year, she said that same New York feeling came upon her, but she was able to shake it off, which is something she said she will do when she goes back to New York this week. Amazingly, Simon was never a runner until she got to high school, unlike many top runners who have been at it since grade school. Simon credited Coach Hernandez with helping her take bigger and bigger steps as a runner and, especially, as a jumper. As a raw athlete, she had talent, but she said Hernandez helped her to develop technique and pushed her not to just rely on athleticism. She also credited her teammates for being a great support system. She also credited her family, who she said has been very proud of her academically and in sports. 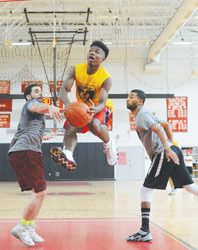 Tom Thompson, Class of 2018, goes up for a dipsy-do layup against Josh Concepcion and Hamza Abdul (L) during the championship of the Battle of the Classes, which kicked off The Movement summer basketball league. Class of 2018 and the Class of 2008 battled it out at Chelsea High on Saturday, June 30. Despite having youth on their side, the Class of 2018 lost out to the champion Class of 2008. The saying “Silence is golden” does not apply when it comes to the Boston Bruins and their fans. Despite the early and frustrating exit, Boston management has had nothing to say regarding the coaching staff, or player personnel, as we approach press time. Those who have been calling for Bruins Coach Claude Julien to be fired, started at the beginning of his tenure, on June 21, 2007. Now, nine years later, and following two consecutive seasons of missing the playoffs, has sparked the call once again. Julien has gone on to become the Bruins’ all-time coaching wins leader, passing the legendary Art Ross, and has advanced the team to the playoffs in seven of his nine years behind the Boston bench. As a result, Julien is presently in the same uncomfortable position as he was at the end of last season when he was ‘put on hold’ for over a month, before he was told that he would be returning behind the Boston bench for another season. It was just three weeks ago that the Bruins honored Julien for his coaching achievement, and presenting him with a black/gold watch. Today we are on a ‘fire the coach’ watch, waiting for word from above as to whether he will be asked back for a tenth season. With a Stanley Cup Championship in 2011, and his impressive coaching record, he has become a ‘wanted’ person by teams looking to make a coaching change. Talk has put the Ottawa Senators as the likely landing spot for Julien if he is dismissed locally, with still another year left on his Bruins contract. The Senators fired coach Dave Cameron and his staff, and the fact that Julien is from Ottawa, makes it sound like a perfect fit for him. There will be many issues to be resolved first, those by Bruins management first of all, and whether they decide to bring him back, and hopefully add some defensive personnel that has been so badly needed. The movement of quality players as Doug Hamilton and Johnny Boychuk on defense, has been damaging, and both were moves that the team still has not recovered from. Perhaps this issue, or parts of it, will be adjusted by the time the Record hits the streets of Chelsea on Thursday, but in my opinion, the dismissal of Julien alone, will not resolve the problem. The man has done his job in the best way possible with the quality of personnel he has been given, and if he is shown the door, it will only be an attempt to take the shortest route by firing the coach, instead of changing players. The time to shore up the defense by adding quality on the blueline is immediate, instead of burning out your number one goaltender, give him some help – less shots and saves to make will preserve Tuukka Rask’s energy, and his sanity! This year could very well see major roster changes, perhaps giving Boston’s maturing youth more playing time, developing them to play more of a major role on a team for the future. In any case, it’s time for Boston management to make some solid decisions and move on! Eastern Conference pairings will have the Washington Capitals/Philadelphia Flyers with the Capitals expected to make quick work of beating the Flyers. The Florida Panthers/New York Islanders will fight it out in what will likely be a long series. The Pittsburgh Penguins/New York Rangers series will probably be quick and easy if Sidney Crosby continues his hot streak. Both teams have question marks in goal, with Marc-Andre Fleury having suffered concussion syndrome, and Henrik Lundqvist struggling with an assortment of injuries. The final pairing will pit the Tampa Bay Lightning/Detroit Red Wings in another possible lengthy series. The Lightning will likely go at least the first round without sniper Steven Stamkos suffering with a blood clot, and defenseman Anton Stralman recently suffered a non-displaced fracture of his left fibula, also likely to be a six or seven-game battle. After two postponements because of inclement weather last week, the Chelsea High baseball team finally took to the field for the start of the 2016 season this past Monday when the Red Devils took on Pope John of Everett. Although Chelsea came out on the short end of a 5-0 decision, the Red Devils received a strong pitching effort from starter Manny Ortiz, who tossed the first five frames, allowing just two earned runs on four hits. The contest was deadlocked at 0-0 through three innings before Pope John broke the ice with three runs in the fourth. The Tigers tacked on two more markers in the fifth to seal the victory. “We struggled at the plate,” said CHS head coach Alan Beausoleil. The lone bright spot for the CHS offense came from Ortiz, a junior, who drew two bases on balls. Mother Nature continued to bedevil the Red Devils Tuesday, with the rain forcing yet another postponement of their contest with Mystic Valley. That encounter was scheduled to be made up yesterday (Wednesday). Chelsea then is set to host Northeast Regional today (Thursday). Next week will be a busy one for Chelsea during the vacation. The Red Devils will entertain Notre Dame/Cristo Rey on Tuesday; travel to Minuteman on Thursday; and host Whittier on Friday. All of the vacation week games are set for 10:00 a.m.
Cesar Castro and Kyle Umemba are hosting a big-time basketball tournament in Chelsea this weekend. On Saturday at the Highland Park courts, eight teams, ages 16 and under, will compete in the first annual Let It Fly Classic. Proceeds from the tournament will go toward scholarships for the Chelsea High School Class of 2016. Three teams will represent Chelsea in the tournament. Revere, Cambridge, and Lynn are among the other cities vying for the championship trophy in the full-court tournament that will have referees. Castro and Umemba, who are co-directors, said they were looking to bring a youth basketball event to Chelsea that would have an impact in the community. “We wanted to be pro-active and help the kids with a tournament that will bring excitement and unite the community,” said Umemba, a graduate of George Washington University who played basketball at Buckingham Browne and Nichols, a prestigious prep school in Cambridge. “We want to bring the city together,” added Castro, who scored more than 1,200 points during his brilliant career at Chelsea High. The two community leaders said that City Councillor Giovanni Recupero, Chelsea Police officer Sammy Mojica, and DPW Director Joe Foti were instrumental in securing Highland Park as the venue and getting it ready for the event. Mojica’s son, Sammy Jr., a basketball player at Drexel, will be in attendance at the tournament. The co-sponsors of the tournament are J.A.B. Step and Chelsea Black Community (CBC), a local organization presided over by Kyle’s mother, Joan Cromwell. The eight team sponsors are: Eastern Minerals, Katz Bakery, Kraft and Hall Associates, Today’s Collision Repair Center, Councilor-at-Large Calvin T. Brown, ROCA, City Manager Thomas Ambrosino, and Blade Masters Barber Shop. The players on the championship team will receive a team trophy and an individual trophy. A Most Valuable Player Award will also be presented. Alex Johnson, owner of the Early Start Clothing Line, donated giveaway bags for the winners. Justin Kitteridge of ISlide donated custom-made sandals for the MVP recipient and the raffle drawing. Castro is a paraprofessional in the Chelsea school system and pursuing a degree in Education at Salem State University. Umemba, who studied finance at George Washington University, will be doing consulting work at Price Waterhouse Coopers, a Big Four accounting firm. Both Castro and Umemba are hoping that their experiences and knowledge can inspire the next generation of Chelsea youths. Cesar Castro and Kyle Umemba will host the First Annual Let It Fly Classic at Highland Park this Saturday at Highland Park beginning at 10 a.m. and continuing through the championship game at 4 p.m.
Castro wishes he had teamed up with the 6-foot-3-inch Umemba at Chelsea High. While in prep school, Umemba played against Nerlens Noel (Tilton), Alex Murphy (St. Mark’s), and Shabazz Napier (Lawrence Academy). The Chelsea Fire Department Hockey Team took first place in the 6th Annual Metro-Fire Hockey Tournament, which took place last week at the Stoneham Arena. Some 16 fire departments participated in the tournament, which was put together by Somerville Fire Department’s Mark Wall. Proceeds from the tournament were donated to the families of Boston Fire Lt. Edward Walsh and Firefighter Michael Kennedy, who were killed in the line of duty in March while battling a 9-alarm fire in Boston. The Chelsea Fire Department team defeated Medford Fire on Friday, April 4, 4-0 and Cambridge Fire, 6-2, on Wednesday, April 9. The Everett/Revere Fire Department team handed Chelsea their only loss on April 10, by a score of 10-8. The Chelsea Fire Department Team advanced to the semi finals where they defeated Somerville Fire 2-0, then defeated Wakefield Fire 3-1 to advance to the tournament finals. On April 13, Chelsea Fire faced off against Everett/Revere Fire for the championship and a year’s worth of bragging rights. Chelsea jumped out to a quick 2-0 lead with goals by Karl Houghton and Nick Quatieri. Everett answered with a power play goal to make it 2-1 at the end of the 1st period. The score was 3-3 with 10 minutes remaining in the game when Karl Houghton scored his 3rd goal of the game putting Chelsea out in front 4-3. Despite an all out assault by the Everett/Revere team in the last two minutes of the game, Chelsea Fire held on to win. This is the first time the Championship was won by a team other than Somerville or Malden. Eighth grader Mia Nowicki is in a class by herself for the St. Mary’s High School varsity softball team. Pitching against opponents who are often four-to-five years older than she, the 13-year-old Nowicki is fast becoming a star in the high school ranks, even though technically she is still in junior high. Mia displayed her amazing stuff in a pitching performance against Lynn Classical Monday night, helping St. Mary’s of Lynn defeat Classical, 6-1, in the championship game of the John Holland Memorial Tournament. Mia was named to the All-Tournament Team one year after nearly pitching a no-hitter and then winning the Most Outstanding Pitcher Award as a seventh grader. It’s an awesome start to a varsity career that may surpass even that of Mia’s father, the great Paul Nowicki, who tore up the Chelsea Little League and the Chelsea Youth Baseball League before becoming an All-Scholastic three-sport (football, hockey, and baseball) performer at Matignon High School in Cambridge. He later earned a spot on Division 1 Clemson University’s football roster. Mia’s mother, Tracy Constantino Nowicki, executive director of the Chelsea Senior Center, was also an athlete of note at Chelsea High School. Mia’s basketball skills are also superb. A 5-feet-4-incg guard, she was the leading scorer on the St. Mary’s junior varsity team and will likely move up to the varsity as a freshman this winter. Mia has been both a starting pitcher and reliever for a 15-5 St. Mary’s softball team that is considered a major contender for the state championship. She has shown steady improvement with a repertoire that includes two fastballs, a curveball, change-up, and screwball. Mia was asked whether she was aware of her father’s incredible career at Matignon and if, in fact, that greatness had rubbed off on her. “I get my talent from God, not from my dad,” she said with a smile.